Canasta game glossary is the focus for this rummy skill games article, part 5 at gamerisms.The rules, scoring and strategies are included for this card game related to the rummy family. This classic card game originating in Uruguay in the 1940s means basket has had many followers over its history. During the 1950s, this card game was the most played within the Rummy family. This Canasta Game Glossary with rules is more intricate than other Rummy games plus there are variations such as Samba, Bolivia and Burraco among others. Also, as most canasta players also enjoy the game of poker, there are 5 Online Poker Tips at the end of this page. The game is best played with four people who play in partnerships of two though 2-6 players can also play. Two decks with four jokers are used that are shuffled together to form a 108 card game deck. 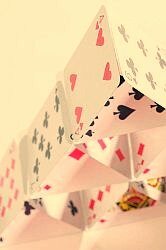 Note that jokers and twos or ‘deuces’ are played as wild cards while the threes are referred to as special cards. All the players pick a card and the one with the highest card deals first. The dealer cuts the pack and starts dealing clockwise with the cards face down. Each player receives a total of eleven cards if four players are playing, if three=13 cards and for two=15 cards. The next card is placed on the table face up to begin the discard pile while the remaining cards form the stockpile. If the up card is a wildcard, another card is placed on it until a non-wild card appears. Other players must also lay out all their red threes before them face up and pick cards from the stockpile to replace them. More about threes or treys later. As a standard, all the subsequent cards that are discarded during the game are placed face up on top of the upcard so that no other discards are visible. The basic goal of winning for this card game is simple--you have to achieve the highest number of points by melding your cards. This is where the game differs from most other rummy games wherein going out early or discarding the end card is of higher importance. The player sitting on the dealer’s left begins the game by drawing a card from either the discard pile or the stockpile. After forming a meld if possible, he/she has to then toss a card and the next player takes his/her turn. However, this drawing action is subject to certain rules that determine whether a player is allowed to draw or not. Melding is much the same as in standard Rummy. Combination of three or more cards can be formed. You are only allowed to make a set (meld consisting of cards of the same rank) and not runs (sequences such as a 2, 3, 4) that are considered invalid in Canasta. All melds must be placed on the table during the game. One partnership cannot have more than one meld of the same rank. A meld comprising totally of wild cards--jokers and deuce is also not allowed. It must have at least two non-wild cards and a maximum of three wild cards. 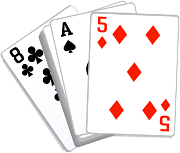 If a player has placed a set on the table, he/she may add cards of the same rank or jokers to the meld but cannot do so to the opponent’s melds. Finally, all the melds of a partnership are placed before one of the partners. A meld consisting of 7 or more cards including a ‘base’ (four non-wild cards) is referred to as a ‘Canasta’. A pure game (all non-wild cards) receives a bonus of 500 points and must be topped off with a red card. A mixed game with 1-3 wild cards, earns a partnership a 300 point bonus and must be topped with a black card. 7, 6, 5, 4 and a black 3=5 points. A red three is worth 100 points and all red threes count 800 points. 100 points for going out and 100 for a concealed hand. A concealed hand is a hand when a player melds all cards in one turn and has at least one Canasta in that meld. He/she must not have made any previous meld or added cards to their partner’s melds. Put the melded cards on the table and add the top card from the discard pile to this to form melds. Take all the cards from the discard pile into his/her hand and form any melds if possible from these cards and then discard one card from their hand to indicate the turn has ended. The discard is frozen for all sides if it contains any wild card or a red three, which is placed at a right angle to indicate. It is also frozen against a side before they make their first meld. A player may unfreeze the discard by taking it. To take the pile, you must have two non-wild cards that can form a meld with the upcard, or a wild card to meld the upcard or by melding the upcard with an existing meld on the table. A player can only go out by discarding the last card after they have melded at least one canasta or if the last card is used to meld one. There is a trick to keep in mind before going out--you should only go out if both the partners have discarded all their cards or one has and the other has a minimum number of cards. Therefore, strategically it can be profitable to continue play even if you can go out. Additionally, you may take permission from the partner in a partnership game before they go out and if they say ‘no’, you cannot go out. If the stockpile runs out of cards, play ends. In addition, if a red three is drawn from the stockpile and if it is the last card, the red three is put face up on the table and play ends there too. If the last card is not a red three, the game continues as long as a player is able to form melds from the discarded cards and the pile is not frozen. You should take note of the cards in the discard pile. It is useful to discard high singles in the early stages as the opponents needs a certain number of points for the initial meld. Do not freeze the pile if you have not melded, otherwise you might end up wasting a wild card. Ensure that you meld before the stockpile runs out. Take care before picking up the discard pile. Only do so if you are sure you can form a Canasta or melds that enable you to go out. For passionate poker players, 5 Online Poker Tips follows at Canasta Game Glossary. 1) Picking a Casino: It’s wise to pick about 5 online casinos in order to move quickly from one to the other during play. An informed selection should consider the casino’s reputation, speed of payouts, ease of depositing and outstanding customer support. 2) Picking a Betting Limit: Specifically $1/2, $2/4 or $5/10 blinds. Knowing that high-stakes limit tables are not the wisest choice, poker players are likely to get a better return on their investment at medium limit tables. 3) Pick Your Stake: Considering that players must have a bankroll that is 50 to 100 times the Big Blind, a larger bankroll not only improves your table reputation, it also intimidates weaker players. 4) Picking a Table: It is best to take 15 minutes or more watching the poker play and players at each table. Additionally, survey at least three tables before you play and choose the loosest table. If all tables are tight, regroup and refer to Tip #1. Canasta Game Glossary is followed by 7 Rummy Versions—more to explore. Canasta Game Glossary + 5 Online Poker Tips is part 5 of the 6 part Rummy Glossary at gamerisms.